This lovely little book is one of my latest additions to my craft book shelf and it is already one of my favourites there. 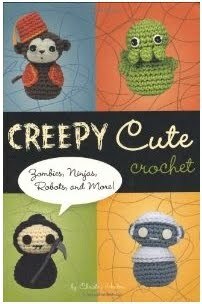 The patterns are fantastic - so very cute and so very different from any other crochet books out at the moment. 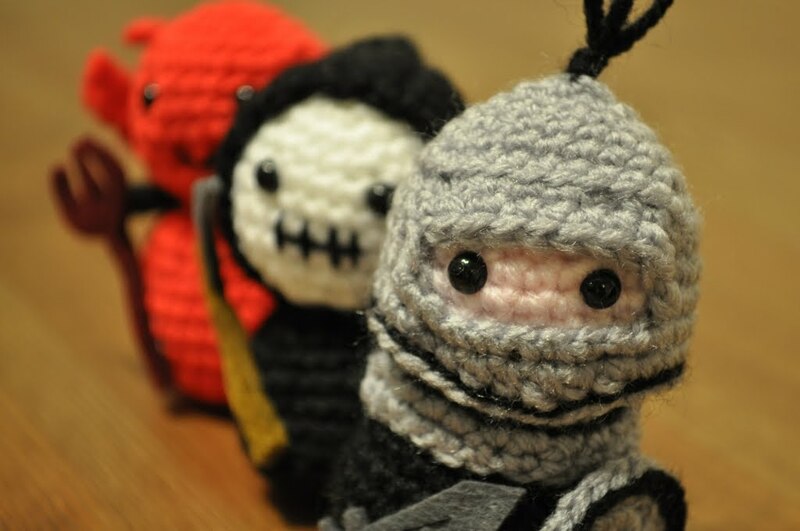 Who wouldn't want their own little grim reaper or amazon warrior to brighten up their work desk? One of the problems I'm regularly faced with is what on earth to make for the male friends and family that I like to send gifts to. Well this book provides 19 perfect gift ideas suitable for blokes and I'm sorely tempted to try making them all. Another great reason to buy this book is that the creatures are very simple and quick to make up, all of them are are based on a basic head and body but once you add the different accessories they become very different and take on their own personalities. The book starts out with some clear advice about all the techniques that you need to create your own creatures including guidance on working with modeling clay, making yarn hair and some specialist crochet techniques (I found the 'clean fasten off' technique to leave a much nicer finish and I'll definitely be using that a lot with my other crochet projects). Each pattern has a clear ability level, a clear photo of the finished item, stitch diagrams, written instructions and step by step assembly instructions (which I found really helpful in creating a professionally finished item). Next up I decided to try a more tricky creature, the handsome knight - and again I found the pattern clear and easy to follow and had no problems putting him together with the help of the assembly instructions. I love his little shield and the embroidered detail on his little sword. One slight problem I did find was that the templates for the weapons were not to scale which would have been easy to do as there would have been plenty of room to print the full scaled versions. 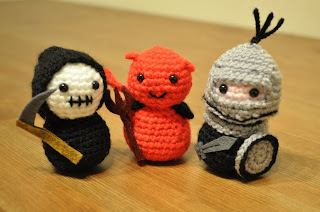 Last up I made the little happy devil and because I didn't find the finished version in the book to be as cute as I wanted him to be I made a few changes. The eyes I used for my creatures were very small safety eyes so my creatures already look slightly different to the original designs. As well as this I moved the mouth lower down and made it a smile instead of just a line. I also left off his goatee as I didn't think it would suit my devil and I gave him a felt trident for extra devilishness. All simple to do and now I have a few more ideas for ways to personalise any future creatures that I make. So to sum up, I love this book. Simply love it. If you too need zombies, vampires, ninjas or any warriors in your life then you really should go out right now and get yourself a copy of this fantastic book. I've come across this book a few times on the 'net - it looks so cute! Thanks for the review - it's helpful to know the instructions are as great as the finished items. Thanks! This book looks awesome. Each time I'm at the store, I think of picking it up. Great to hear you gave it such a great review! Thanks Anonymous for highlighting needlenoodles website, I'm going to bookmark a few of her free expansion characters for some of my future projects, there are some great characters up there!